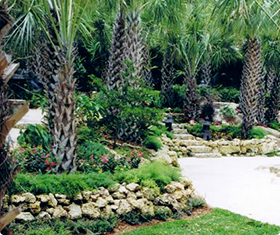 Anderson Landscaping is a recommended source for landscaping design in Coral Gables, Key Biscayne, Miami, Miami Beach, Palmetto Bay and Pinecrest. They can transform your garden or outdoor areas into something that is beautiful and inviting. They provide both commercial and residential landscape design services. Landscape design creates the blueprint for landscape installation. It requires skills such as architecture, design flair, artistry, science, maths and of course knowledge of local flora, fauna, weather patterns and so on. Updating your landscape and outdoor spaces will improve your lifestyle and add value to your property. Beautiful outdoor areas in your garden provides the space where you can relax and entertain. You don’t need to have big outdoor spaces to benefit from landscaping design. Professional landscaping design can help transform small front yards, small backyards and even create beautiful rooftop gardens. Landscape design combines important elements to create a blueprint for beautiful and inviting outdoor spaces. Some of these are color, line, form, balance, flow, scale, texture, unity and simplicity. A colorful garden is one that is vibrant and lively. The right mix of primary, secondary and neutral colors are important when it comes to landscape design. Scale is another important element of professional landscaping design. You need to keep things proportional. You don’t want to put a big tree in the middle of a small garden. Plants and shrubs paly an important role if the form of your landscape. You can create a formal look with symmetry or a more natural look with asymmetry. A professional landscaper understands the principles of design and knows how to incorporate and implement them. Anderson Landscaping can help you with both landscape design and landscape installation. They can transform your outdoor spaces in Coral Gables, Key Biscayne, Miami, Miami Beach, Palmetto Bay or Pinecrest.